From what I read in the literature, engagement and workload are often associated to the ratio of the Beta power to the Theta + Alpha power. This ratio is supposed to increase with increasing workload, which would mean that either Beta energy increases or Theta / Alpha energy decreases which is not what you obtain (even though you did not check Beta energy which might increase more than Theta). Any comments or explanation ? My EEG knowledge is a bit hazy, so Steve will have to correct me if I’m wrong (which I probably am :)). As you may or may not know theta activity has been found to be associated with different types of mental activity (Schacter 1977) (e.g. increases with lack of attention). Depending on the location theta is measured from the activity your inferring changes. The beta/(theta+alpha) ratio which was tested by (Pope 1995) in his engagement work does work as you describe. However their recordings are based on a monopolar recordings at CZ (I’m using his videogame work which is basically the same, sorry can’t find my 1995 paper at the moment). The work here uses a different placement and so the inferred mental activity (theta increases with lack of attention) is not applicable. The engagement index was derived from the work of Alan Pope as Kiel points out. 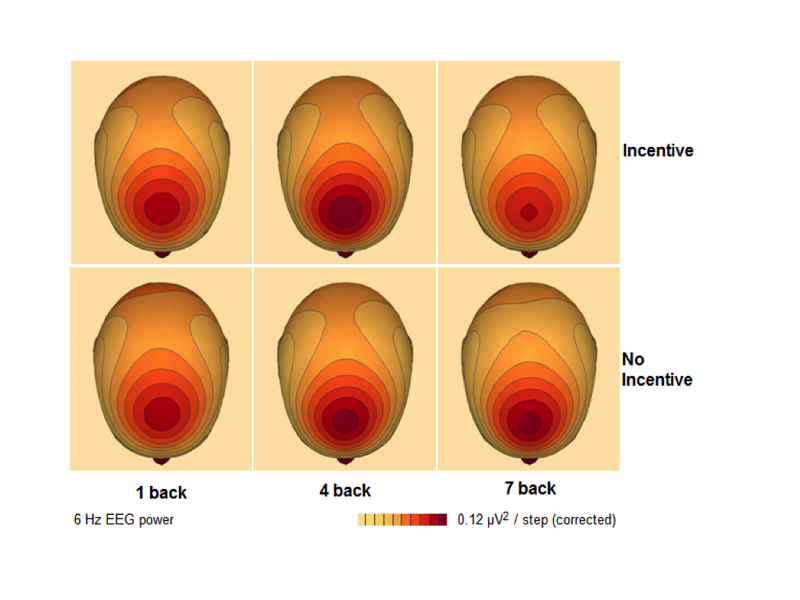 These kinds of EEG ratio scores where faster activity is divided by slower activity are a good way of capturing the central idea that slower (theta, alpha) activity is associated with lower levels of brain activation whilst the opposite holds true for faster activity (beta). Studies of alpha activity and fMRI activity (I don’t have the ref to hand) have supported this notion. Gevins, A., & Smith, M. E. (2003). Neurophysiological measures of cognitive workload during human-computer interaction. Theoretical Issues in Ergonomic Science, 4(1-2), 113-121. Gevins, A., Smith, M. E., Leong, H., McEvoy, L., Whitfield, S., Du, R., et al. (1998). Monitoring working memory load during computer-based tasks with EEG pattern recognition models. Human Factors, 40(1), 79-91. Gevins, A., Smith, M. E., McEvoy, L., & Yu, D. (1997). High resolution EEG mapping of cortical activation related to working memory: effects of task difficulty, type of processing and practice. Cerebral Cortex, 7, 374-385. Hey Stephen, hope you’re well. After putting “gevins” “engagement” in google (see if there was anything new! ), it came up with this. Clever Google. Sounds interesting, few quick questions..What was your sample size? Is the above data averaged over all participants (i think unlikely, if not how many were excluded and for what reasons)? What was the task? Just for some further neurophysiological evidence, check this link: http://lpp.psycho.univ-paris5.fr/pdf/2529.pdf, seems that theta recorded from frontal regions possibly reflects intentional action (read effortful engagement), and involves the frontomedian wall (specifically the preSMA and the rostal cingulate zone). The frontomesian complex also contains the ACC, so converging evidence with Gevin’s work. Frontal theta activation (together with parietal alpha inhibition) is definitely associated with effortful engagement…in some people, some of the time. Possibly the role of intentional v automatic reponses helps explain some of the individual differences which plague this research. The same people do the same task in different ways (the terms ‘same’ and ‘different’ are entirely interchangeable), sometimes fully engaged (intentional/deep processing), sometimes fully distracted (automatic/shallow processing). Usually somewhere in between with periods of engagement and periods of distraction. Am gonna stop rambling, have just checked the date of this thread…mothballs? And if I recall correctly this paper has a description of the study this post was relating to. Thanks for the links Kiel, much appreciated. I’m curious to know, with a starting sample of 34 participants, why only 18 were used for the ‘grand average’ in figure 3? Also, any problems with some individuals having very low spectral power (in frontal theta), even though task performance was high? ^^ Could be because you had to pay them for the incentive study…pesky budgets! Good to hear from you. Hope all’s well with you. The figure in this post is taken from a study of 20 participants. Unfortunately Kiel directed you to the wrong experiment – this one has not been published yet except as an abstract at SPR. Thanks a lot for the link; I hadn’t seen that one. As you say, there is converging evidence here for a frontomesian effect taking in the ACC and the rostral cingulate. As you might know, there is also a lot of evidence from Gendolla and Wright for systolic blood pressure reactivity being linked to effort. I mention this in passing because we found some convergence between our frontal theta results and systolic reactivity; also, ACC has been implicated in BP control. I remember writing a lot of stuff about the link between ANS activity and frontal neural networks during cognitive processing (ended up on the cutting room floor!). Had a whole section on ECG/EEG interactions, and can remember reading about systolic BP. No suprise really, since during effortful task engagement we would expect significant (system wide) mobilisation of energetical resources. Seems likely that these frontal neuronal oscillations represent preparatory, anticipatory and regulative co-ordination of parasympathetic activity, which in turn subserves cognitive functioning. “The master timing mechanism…”? What a shame that part of the thesis got cut. I would have liked to have read it. Interactions between autonomic and neuroscience measures remains relatively unexplored. I recommend checking out Hugo Critchley‘s work on connections between ACC and cardiovascular system if you haven’t already. As you say, we would expect to see some convergence between the groups of measures and you would expect them to pull in the same direction. Diffusion spectral imaging shows really interesting clustering around frontomesian regions and major cluster of interconnected cortico-cortical propogations in parietal and posterior medial regions. Looks like two control centres, one fronto-mesian, the other parietal/posterior. Not to mention the really impressive looking piccies! Thanks Michael. I hadn’t seen that work with spectral imaging. I’m reminded of some work that is indirectly related on EEG coherence patterns during working memory load, such as this one by Sauseng et al (2005) – which links frontomesian patterns with a parietal regions.